Samaritan offers many ways to volunteer. Patient/family support volunteers visit patients and families in their homes and offer support through companionship, reading, writing letters, sharing stories and acting as a friend or neighbor. Vigil volunteers provide a supportive presence during a patient’s final house and offer a beautiful final gift of peace and solace. If you are interested in volunteering, please contact Sharon Wenner at (856) 552-3238 or swenner@SamaritanNJ.org. 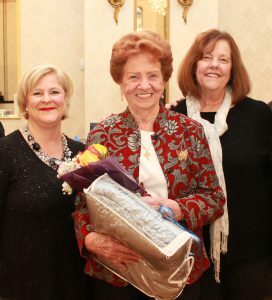 Joan Harrigan.jpg – Joan Harrigan of Moorestown was recognized by Samaritan Healthcare & Hospice for an agency-record 7,000 hours and 20+ years of volunteer service to the organization. Pictured from left: Sharon Wenner, volunteer recruiter, Samaritan Healthcare & Hospice; Volunteer Joan Harrigan of Moorestown; and Sally Cezo, director of volunteer services, Samaritan Healthcare & Hospice.